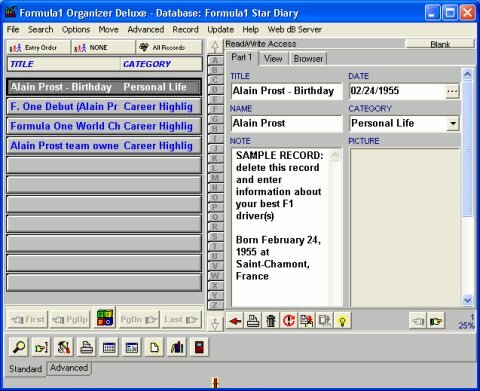 Formula1 Organizer Deluxe is a Windows software that allows PC users to organize and manage all Formula 1 related data. For the database novice, Formula1 Organizer's intuitive interface and ready-to-use templates make it easy to set up and use.For the power user, Organizer affords the simplicity of wizards that make it easy to set up and use the Formula1 database organizers that you create. Allows PC users to organize and manage all Formula 1 related data. ...... to set up and use the Formula1 database organizers that you create. The Formula 1 Organizer Software gives you total control over the structure of the database, and the way data appears in data-collection screens. Qweas is providing links to Formula1 Organizer Deluxe 3.7 as a courtesy, and makes no representations regarding Formula1 Organizer Deluxe or any other applications or any information related thereto. Any questions, complaints or claims regarding this application Formula1 Organizer Deluxe 3.7 must be directed to the appropriate software vendor. You may click the publisher link of Formula1 Organizer Deluxe on the top of this page to get more details about the vendor.